Murrell, John N. - interview concerning : Early Ideas in the History of Quantum Chemistry. 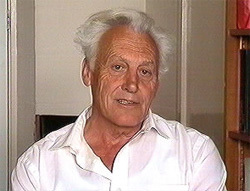 John Murrell was born in 1932. He studied at Cambridge and became Professor at the University of Sussex, Brighton. He did a vast amount of research in the field of quantum chemistry. His book Valence Theory, one of the many he wrote, was tremendously well-liked and well-received in the period 1965-1990, say. Video clip Murrell talks very briefly about his Valence Bond book. (40 sec) MPEG4; 4 MB Just in case, for Win9x,ME,NT4(? ): Get the free download codec DivX4FullInstaller.exe V.4.02 (710 KB) (or better). Or you may obtain presently (11/2001) from Microsoft the Windows Media Player 7.1 / 10MB, www.microsoft.com, in Europe from : http://www.eu.microsoft.com/germany/ms/windowsmedia/. Sound clip Murrell talks about the art of writing good scientific books.